Do your videos or photos lack color and fun? You need some color! This project is super easy, cheap and totally custom made for you, by you. Learn how to make your own abstract background. All you need is paint and a white foam core board and 10 minutes of your time. You can use it for your product pictures, flat lays and videos. DIY project for any day. I use it for my lettering videos. A piece of foam core board, white. Any size you need. I got the giant size in this video. Acrylic paint of your choice. These can be found in the art or craft section at your local art store. Any acrylic paint will be fine. Nothing expensive is necessary. A nice big brush. I used one that we use for painting the house walls. If you don't have a big brush, a sponge can work as well. Watch the video and then create your own beautiful background. Share your results with me, tag me in your Instagram post @TwoEasels or join my Lettering Facebook Group. This is to prevent major warping. Although warping will still happen once the front dries, it won't be as bad. Step two: Put some paint straight on the board. You can start out with just one color or add more in. Although some colors might not mix well. You know, blue and orange next to each other will create brown when mixed. You can start with one color, let it dry and then add more on top or next to. 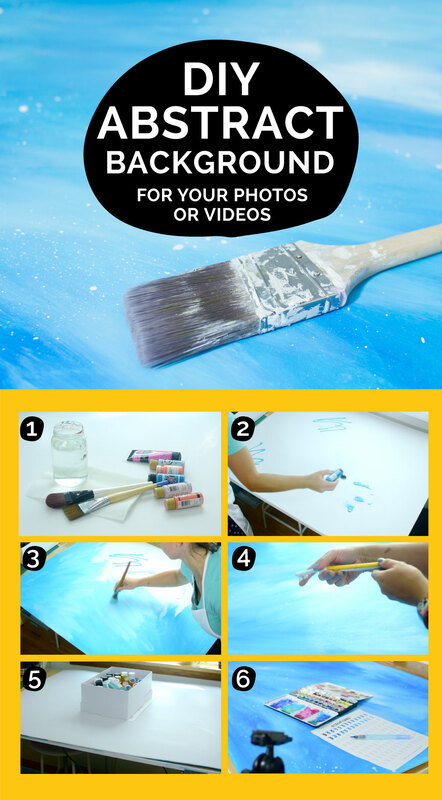 Step three: Now just grab a brush or even a sponge, heck, you can use your hands, in gloves, and spread the paint around, mixing well from color to color for smooth transitions. Step four: Once you have your color nicely mixed you can add some splatters to make things more interesting. I used white acrylic paint and some water to make it thinner. Then I dipped an old toothbrush and flicked it with my finger to make nice splatters on the board. Step five: Once your paint is dry, flip the board over, spray with a little water and place something heavy. Best to place something on all corners and center to prevent most of the warping. Also, you can just paint another background with a different color on the other side. And once that is pretty dry place something heavy on all corners overnight to straighten it out. Step 6: All done! Place your art, props or products and take some photos or videos. Comment below with any questions and suggestions for other diy tutorials that you'd like to see.